Stuck in a rut with dinner? Craving pasta but fearing the fact you’ll eat enough noodles to feed a small army? This Healthy T Beefy Slawghetti recipe is such a life-saver! It’s light, healthy and super easy to make. 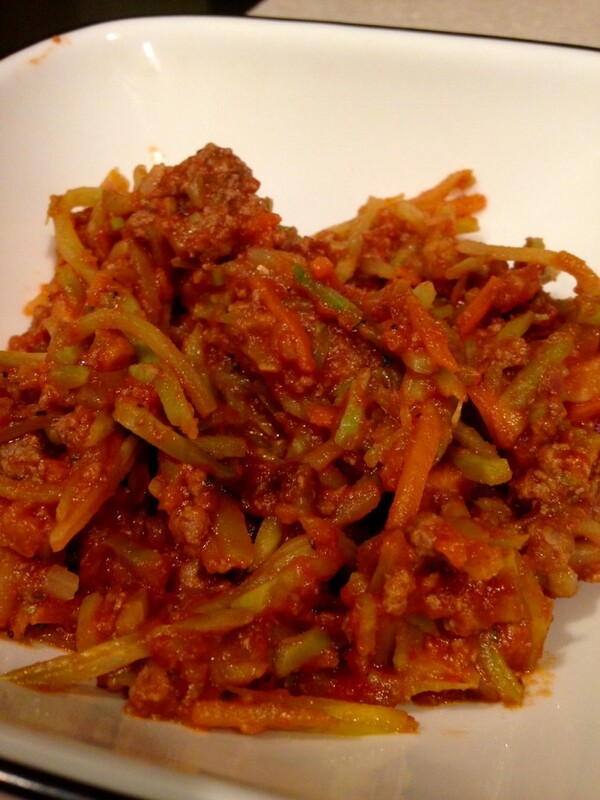 All you need is one skillet for this healthy ground beef recipe! At only 300 calories per serving, this one pot recipe is a weeknight winner. But what the heck is slawghetti? The greatest life hack you’ll ever learn. You can make virtually any pasta swap using a bag or two of broccoli slaw! 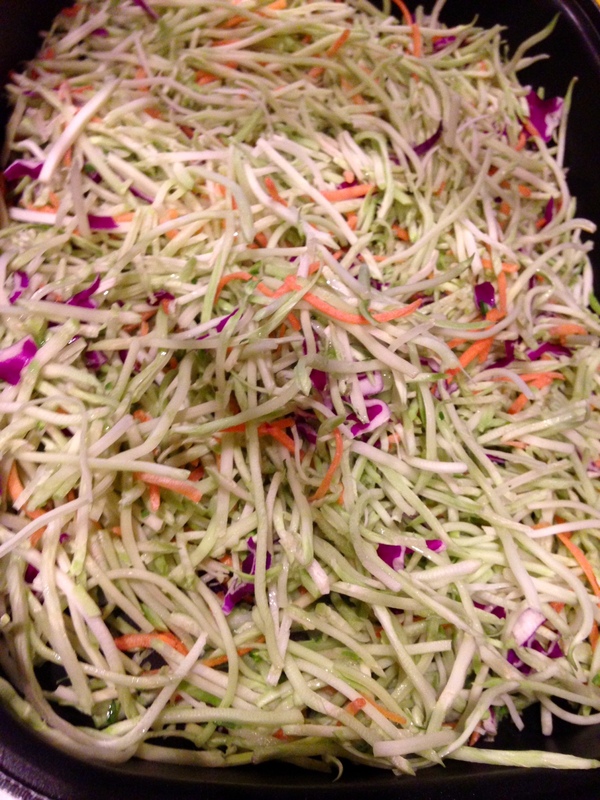 When you heat broccoli slaw with just a small amount of water, the slaw softens and becomes noodle-like. 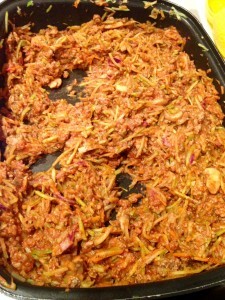 It mixes well with meat, sauce and other veggies. 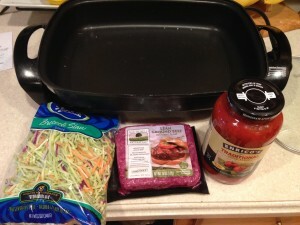 I’ve even used broccoli slaw for chili and Sloppy Joe’s. For this Beefy Slawghetti recipe, I chose to use extra-lean ground beef and salt-free spaghetti sauce. I think the lean beef is important because you’re making this meal in one pot and you don’t want the slaw soaking up much fat. The spaghetti sauce is totally your choice. I usually like to use salt-free when I’m making a point to eat healthy, but I do love a rich, flavorful sauce from time to time! What’s also great about this recipe is you can control how many ingredients you want to work with and how much spice you’d like to add. Essentially, you only need slaw, beef and sauce. But I chose to add some crushed red pepper, mushrooms and Parmesan cheese to my meal for added bulk and flavor. 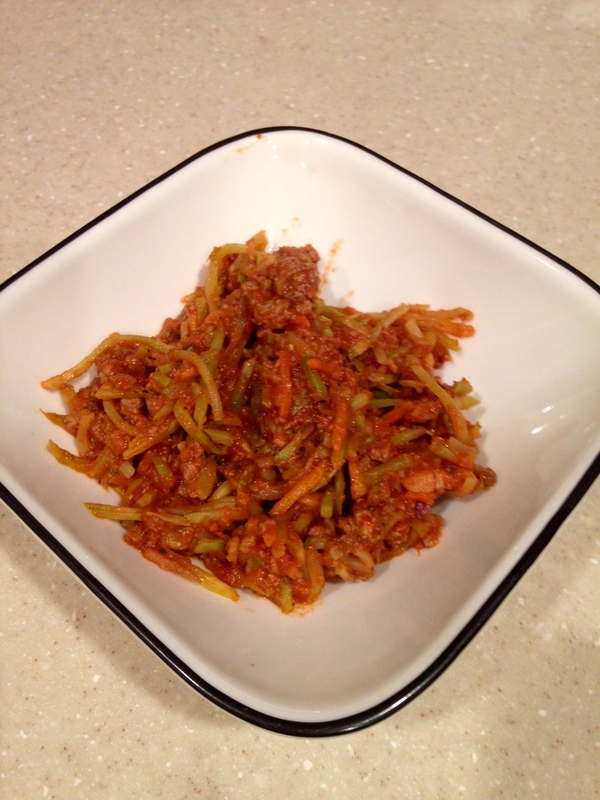 I love Beefy Slawghetti as a post-workout meal because it’s low carb and chock-full of protein! One serving is just 300 calories! A similar spaghetti dish with real noodles would cost you about 600 calories at Olive Garden. With this simple swap, you can add a glass of wine or dessert – Now, who can argue with that? Coat a skillet with olive oil or cooking spray of choice. Warm on medium-high heat. 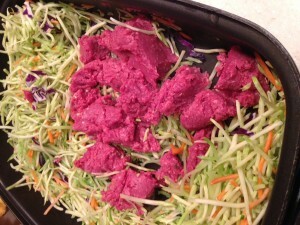 Add broccoli slaw and 1/2 cup of water. Cover skillet. 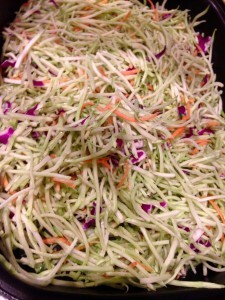 Cook broccoli slaw on medium-high for 2-3 minutes, stirring occasionally, until water begins to dissolve. 2. Add beef and optional mushrooms to your same skillet. Cover. Continue to cook on medium-high heat, stirring occasionally, for 10-12 minutes (or until broccoli slaw is soft and beef is browned). Note: I used 93 % fat-free ground beef since this is a one pot meal and I didn’t want excess fat soaking into the rest of my dish. 3. Make sure the water added earlier is mostly dissolved. If not, drain. Add sauce to your same skillet, stirring until uniform. Cover. Cook on medium-low heat, stirring occasionally, for 2-3 minutes. 4. Serve into bowls and top with optional crushed red pepper and Parmesan cheese. Will you try this one pot meal?